This Quick Start automatically deploys Chef Automate, which is the highly scalable foundation of the Chef automation platform, on AWS. You can use Chef Automate to create and manage dynamic infrastructure that runs on the AWS Cloud, or manage the servers in your on-premises data center. The Quick Start gives you instant access to Chef Automate, which includes Chef Server, Chef Analytics, Chef Management Console, and Chef Reporting. This Quick Start performs Chef Automate initial setup, creates the Chef administrative user account, and enables HTTPS access over the internet and within your virtual private cloud (VPC). You can include an optional Chef workstation and configure it, create and upload a cookbook, and bootstrap an EC2 instance with Knife, which helps you manage infrastructure components. Chef Automate deployed into the VPC subnet. An Elastic IP address is allocated and associated with the instance. During instance launch, Chef Automate is bootstrapped and configured using the settings you specify when you launch the stack. A Chef workstation running on Microsoft Windows Server deployed into the VPC subnet. This server has a public IP assigned and is accessible via Remote Desktop Protocol (RDP) over the internet. Both Git and the Chef Development Kit (Chef DK) are automatically installed on this machine via the AWS CloudFormation bootstrapping process. This Chef workstation is optional. You can use a workstation in your own on-premises environment as an alternative. This Quick Start uses Windows Server for the Chef workstation, but you are free to use any supported operating system for your own Chef workstation. One Ubuntu Server node deployed into the VPC subnet. After you deploy Chef on AWS, you can follow the steps in the deployment guide to configure a local Git repository (chef-repo) on the workstation, create and upload a cookbook to Chef Automate, and then bootstrap the node and run the cookbook to configure a basic web server. As with the Chef workstation, this node is optional. 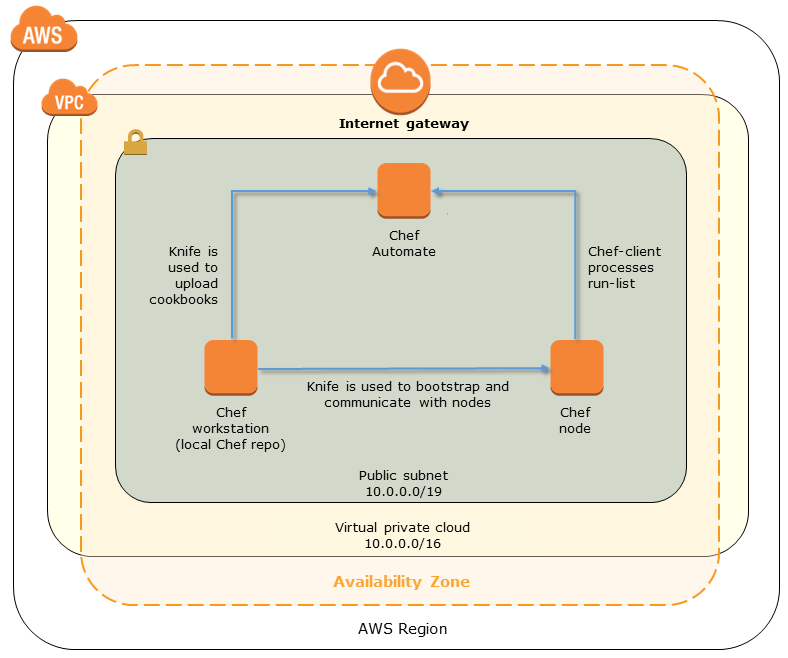 With Chef Automate running on AWS, you can manage other nodes that you deploy on AWS, or manage nodes that are located in your on-premises data center. Subscribe to the Amazon Machine Image (AMI) for Chef Automate in AWS Marketplace. Launch the Quick Start and customize your settings. The deployment takes about 35 minutes. Configure Chef Automate by following the instructions in the deployment guide. Configure a Chef node. You can follow the walkthrough included in the deployment guide to set up a Chef workstation and Git repository, create a cookbook and recipe, bootstrap a node, and run the cookbook. This Quick Start uses Amazon Machine Images (AMIs) from AWS Marketplace. Before you deploy the Quick Start, you must subscribe to Chef Automate in AWS Marketplace, and additional pricing, terms, and conditions may apply.